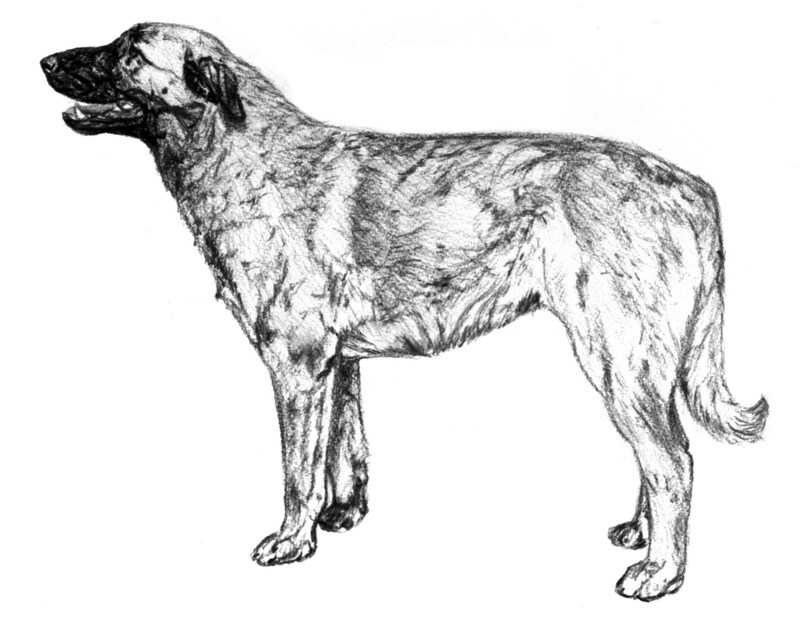 : A livestock guarding dog, watch dog and companion dog; also used for draught work. : Since remote times, this dog has developed and settled in the Estrela Mountains area, its true origin being lost in time. Nevertheless, it can be considered one of the most ancient breeds in the Iberian Peninsula. It can be found from the foot of the mountains to the summit (approximately 2000 m), mainly in the summer, after the snow has melted, when the green pastures are much sought after by the herds, because the excessive heat has dried the grass on the lowlands. The progressive recognition of its aptitudes has led to its diffusion throughout the world since the second half of the 20th century. : Large, mastiff-type molossoid dog. There are two varieties of coat long and short. Rustic, substantial, with brisk gait and an impressive attitude. : Moderately long (sub-longilinear), tending to mediolinear. The depth of the chest is less than half the height at withers. The muzzle and skull should be approximately the same length; if not, the skull should be slightly longer. : Inseparable companion of the shepherd and faithful flock guardian, bravely protecting it against predators and thieves. Wonderful farm and house guard, distrustful towards strangers and typically docile to its master. : Strong, voluminous and long and slightly convex seen in profile. Well inserted and in good proportion to the body, with the skull in proportion to the foreface; all parts in perfect harmony. Smooth skin on the skull and cheeks. : Well developed, rounded, with slightly divergent longitudinal superior cranium-facial axes, convex profile, slightly developed superciliary arches with slightly apparent frontal furrow, occipital protuberance not prominent. : Only slightly marked and at approximately equal distance to the tip of the nose and the occipital protuberance. : Straight and in line with nosebridge; well opened nostrils; large and black. : Long, tapering to the tip, without being pointed; tends to be straight but very slightly convex at the tip. : Well developed but not thick, well overlapping, not pendulous; mucous membrane of mouth, palate and edges of lips with intense black pigmentation. : Clean cut mouth with well developed jaws; full dentition with strong, white, well implanted and close-fitting teeth, preferably with scissors bite, pincer bite acceptable. : Medium sized, tending to small, oval shaped, level set, equal in size and well open, with a keen and calm expression; preferably dark amber in colour. Close fitting lids with black rims. Eyebrows slightly apparent. : Set on at medium height; hanging, carried falling backwards and laterally against the side of the head, with inner edge visible (so called rose-ear); thin, triangular, rounded at the tip; small in comparison to the body. : Short, straight and thick; well set and well connected into the shoulders; with a slight dewlap, not exaggerated. : Preferably short, well muscled. : Short; broad; well muscled; well connected to the croup. : Slightly sloping; short, broad and muscled. Height at croup should be equal or slightly superior to the height at the withers. : Broad; deep; well sprung without being cylindrical; well let down to the elbow or slightly below it. : The underline should rise gradually but smoothly from sternum to the groin; belly not too wide, in proportion to the animal’s substance and harmoniously connected to the body. : Set on at medium height; long; thick; carried below the horizontal, scimitar-shaped, with a hook at the end. : Upright with strong bone and thick joints, moderately open angulation, with easy movement. : Straight, parallel, long, with strong bone and almost cylindrical in shape. : Proportioned, neither too round nor too long, between cat and hare feet (not splayed); thick, tight toes with abundant hair between toes and pads; dark nails, preferably black, well developed; pads thick and hard. : Upright, strong bone with thick joints, moderately open angles, with easy movement. : Slightly let down; moderately open, neither turned in nor out. : Vertical, almost cylindrical. Possible presence of single or double dewclaws. : Sound and easy movement. Strong, very abundant, slightly coarse, without excessive harshness, the texture is similar to goat hair. Long-haired variety: Straight or slightly wavy top coat, uneven in some areas. It is shorter and more dense on the limbs, below the elbows and hocks, as well as on the head; on the ears, it becomes gradually shorter from the base to the tip, becoming thinner and softer. It is longer on the tail, which is bushy, thick and feathered, around the neck and throat and on the buttocks, which are abundantly feathered, as well as the back side of the forearms. Short-haired variety: Short hair, evenly distributed over the body, slightly shorter on the head and limbs, without feathering. Wolf Grey: fawn, yellow and grey tones, commonly in lighter and darker shades. Brindle: fawn, yellow or grey base colour with blackish brindling. : Males 65-73 cm. Females 62-69 cm. Tolerance + 2 cm. : Males 45-60 Kg. Females 35-45 Kg. Appearance General bad appearance, thinness or obesity. Height Outside the limits set by the standard, but within 2 cm tolerance at the upper limit. Head Narrow, long and pointed. Ears Incorrectly set, too long, thick or rounded tips. Hanging completely flat. Tail Carried over the back. Absence of hook. Colour Absence of dark mask. Behaviour Animals showing nervous unbalance with signs of shyness. Nose Pale coloured nostrils, partly unpigmented nose. Coat Hair somewhat different from the described type. Head Very narrow, very long and very pointed completely lacking molossoid type. Eyes Wall eyes or difference in size. Colour Any colour not mentioned in the standard. Albinism.